080808 On,Now,To the Third Level: Did a prayer meeting really bring down the Berlin Wall? I do like it when the BBC put up something more real. Christine saw this great report this morning which fills in some of the details I had felt from the Lord and written about here. So how did the church end up playing such a prominent political role under an atheist regime? Disillusioned with the Berlin Wall, the physical fault line of the ongoing Cold Warand the repressive East German regime, Pastor Führer began organising Prayers for Peace every Monday evening, beginning in 1982. On many occasions fewer than a dozen people attended the prayer meetings. The East German government strongly discouraged its citizens from becoming involved in religious activities, but the meetings continued each Monday without fail. 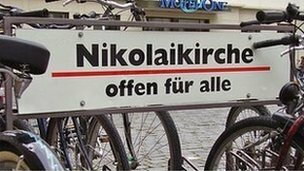 In 1985 Pastor Führer put an "open to all' sign outside the church. 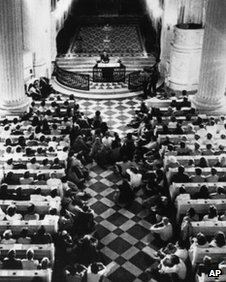 Such a gesture was loaded with symbolism as the church provided the only space in East Germany where people could talk about things that could not be discussed in public. Meetings were open to everyone. Young people, Christians and atheists all sought refuge there. Attendances soared as word of the peace prayers spread. Momentum began to build in earnest during the summer of 1989, as Pastor Führer recalled in an interview with the BBC World Service programme Heart & Soul in 2009. "On 8 May 1989, the authorities barricaded the streets leading to the church, hoping to put people off, but it had the opposite effect, and our congregation grew. There were beatings and arrests of demonstrators at protest rallies in Leipzig, Berlin and Dresden," he said. By this time the prayer meetings had led to a series of peaceful political protests in Leipzig and other cities which became known as the Monday Demonstrations. For years the prayer meetings had largely been ignored by the East German authorities, due to the lack of numbers. As the scale of the gatherings grew, the pastor and his followers were threatened and pressure was put on them to stop the meetings, but they remained resolute. Things came to a head on 7 October 1989, the 40th anniversary of the German Democratic Republic. "There were hundreds of arrests made among the crowds in front of the Nikolai Church. Erich Honecker (the Communist leader of East Germany) had declared that the church should be closed. The police used brute force against the demonstrators and lots of people were beaten," Pastor Führer recalled. An article appeared in a local newspaper announcing that the counter-revolution would be put down on Monday 9 October "with whatever means necessary". People involved in the meetings feared a bloodbath, with the memory of the Tiananmen Square massacre in China that summer still fresh. "The church was visited by doctors who told us that hospital rooms had been made available for patients with bullet wounds. So we were absolutely terrified of what might happen," Pastor Führer said. On 9 October 1989, as Leipzigers returned home from work, they saw the city fill with soldiers and police, increasing the sense of foreboding. Leanna, a member of the group Women for Peace who helped organise the prayer meetings, recalled on the BBC Heart & Soul programmehow she had already been harassed by police and reflected on the anxiety the protesters experienced. "The over-riding feeling on the day was fear," she said. "I had lost custody of my children for a while and they even threatened to put my youngest daughter into a children's home. The official documents said I was unfit as a mother because I was involved in extremist groups." Up to 8,000 crowded into St Nicholas Church, including members of the feared Stasi (secret police) who had been sent to occupy it. Other Leipzig churches opened to accommodate additional protesters. About 70,000 people had now gathered in the city. After an hour-long service at St Nicholas, Pastor Führer led worshipers outside. 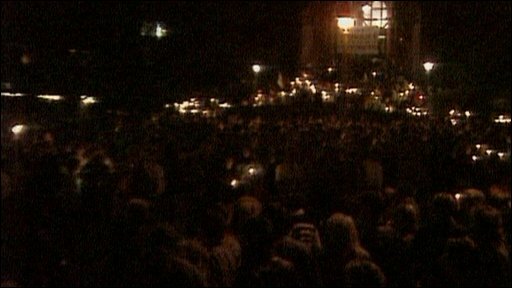 The nearby Augustusplatz was filled with demonstrators clutching lit candles. 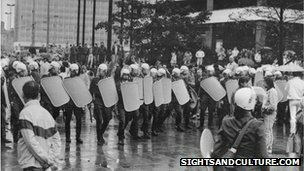 Slowly, the crowd began walking around the city, past the Stasi headquarters, chanting "we are the people" and "no violence", and accompanied by thousands of helmeted riot police ready to intervene. But at the decisive moment the police stood aside and let the protesters march by. Pastor Führer said: "They didn't attack. They had nothing to attack for. East German officials would later say they were ready for anything, except for candles and prayer." The late Brian Hanrahan, former diplomatic editor for BBC News, reported and secretly filmed from Leipzig that night. Recalling the protest 20 years later, Hanrahan said he had since heard rumours that local Communist officials had struck a last minute deal defying Honecker by letting the march continue, as he reflected how close Leipzig came to a massacre. "It took great personal courage to confront a government notorious for its ruthlessness," he said. "There was a sense of foreboding that this was likely to end with a great deal of bloodshed. I found out just how close that came to happening - a massacre was just minutes away." This would prove to be a seismic moment. The fact they had been met with no violence meant the protest movement began to lose its fear. The dam had burst. 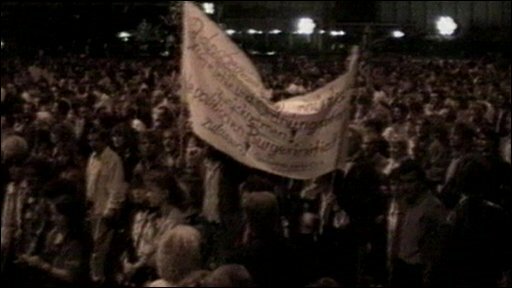 Footage of the march was widely broadcast, which inspired Monday Demonstrations throughout East Germany in the following weeks. About 120,000 people took to the streets the following Monday. Erich Honecker resigned two days later. The dissidents became increasingly emboldened, with around 300,000 taking part in the protests on 23 October. Exactly a month after the events of 9 Octoberthe Berlin Wall came down amid scenes of jubilation witnessed around the world. This was just one of many monumental events in a year that saw the Iron Curtain torn down, the end of the Cold War and ultimately the reunification of Germany on 3 October 1990. The will of the people had triumphed through peaceful protest. Pastor Führer was adamant the Berlin Wall would not have collapsed without the events in Leipzig. "Things were happening in Leipzig that weren't happening anywhere else," he said. "The people who came to demonstrate on 9 October came from all over East Germany. Without Leipzig, the Berlin Wall would not have fallen, let alone the reunification of Germany. "What moved me the most was that people who had grown up in two atheist dictatorships - first the Nazis then the communist regimes - were able to distil the message of Jesus into two words: no violence. "Without the church it would have been like all other revolutions before - bloody and unsuccessful." German historian and author Jens Schöne believes that while the importance of the prayer meetings cannot be over estimated, there were other crucial factors. "The weekly prayers and demonstrations illustrated that people were fed up with the system and wanted fundamental changes. "But in my opinion it was a chain of events that influenced each other and resulted in bringing down the wall, including the refugees in the different embassies and the events in Dresden, Berlin and Leipzig. "The emergence of Gorbachev as the Soviet leader was also very significant in ending the Cold War," Schöne said. Dr Todd Weir, lecturer in Modern European History at Queen's University Belfast, who was an exchange student in East Germany in 1988, cites the erosion of power of the East German regime as being decisive. "The inability of the state to prevent the exodus of East Germans via the Prague and Budapest embassies in the summer of 1989 was crucial," Weir said. But for Brian Hanrahan the importance of that night could not be overestimated. Speaking in 2009, Hanrahan summed up the protest's impact: "Honecker was gone in a week, the Berlin Wall in a month, brought down by the bravery of the Leipzig protesters." As for Pastor Führer and St Nicholas, the pastor continued his role in the church until his retirement in 2009. The weekly prayers for peace continue at St Nicholas. After the fall of the Berlin Wall, St Nicholas went back to being a normal parish church. But Pastor Führer said their actions had not been about boosting attendance figures in their congregation. "We did it because the church has to do it," he said.